High speed urbanization is usually accompanied by pollutants being released into the environment hampering the health of the aquatic ecosystems. This calls for the urgent need to establish appropriate measures to counteract ecological disturbances. Even though this is happening in many parts of the world, it is especially notable in developing countries such as India, where the rate of urbanization is very high. Run-off waters cause pollutants to accumulate in nearby aquatic bodies and sometimes lead to unexpected and sudden changes in the state of trophic levels. How such increases in the magnitude of environmental stressors and pollutants lead to massive die-off events is the central story of this short article. In the context of this alarming situation, a recent episode of massive fish death in Bata river of Odisha state (India) is discussed to highlight the alarming situation of this area, aiming to attract the attention of both Governments and ecological managers to put in place counter measure plans to avoid such events from occurring in the future. High-speed urbanization leading to environmental pollution is a challenging issue in developing countries such as India (Paital, 2016a). Especially, aquatic environmental pollution as a result of rapid development due to discharge of effluents from human house hold and industrial sources leads to pollute riverine waters. This is because riverine systems act as the connector between surface run-off and larger water bodies such as ocean. Therefore, riverine bodies become more susceptible for accumulation of pollutants. As a result, it affects the trophic level especially at secondary or tertiary trophic levels in a riverine ecosystem. 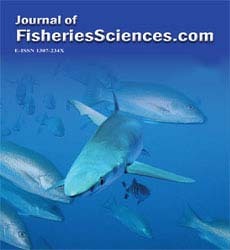 Fish, the major trophic level that seems to be affected first, despite, reason(s) behind death of lower and higher trophic level aquatic animals remained unanswered many times (Paital et al., 2016a). If prolonged in time, such climatic events may change eventually to affect both faunal and floral diversities including human health (Leaf, 1989; Epstein, 1999; Sing et al., 2016). Such an event recently manifested in Indian subcontinent may alarm for the ecophysiologist and conservationists to restrict massive death of fishes in fresh water aquatic bodies. On early morning of 5th June 2016, carcasses of about >4.5 lakhs Indian carps (mainly, Labeo rohita, Catla catla and Cirrhinus mrigala), were noticed floating in the water of Bata, River, near Balijhara, Paradip, Jagatsingpur, Odisha. Immediately, there was rush of media and experts into the field to short out the case. The researchers tried to investigate the case with an objective to find the link between that disasteric event and the prevailing high temperature (>46°C) of the environment encountered. The carcasses were quickly removed by Government officials for analyses and to restrict further pollution (Figure 1). Finally, analyses of water sample gave an impression about the risk of urbanization in and around the river, which directly affected such massive death. The reasons for fish death in Bata river have been revealed by the state Government of Odisha that due to heavy construction and its effluent discharges from nearby 25 acre areas and the modern wastes from households, discharging chemical effluents from nearer industries are the main causes to pollute the river water. The polluted water had high basicity, BOD, NH3, nitrate, PO4 and salinity as well. Particularly, 450 mg hardness, 1.25 mg PO4 and 1.65 NH3 per litre water have been reported (The Sambad, 2016). The reason was mainly ascribed to high speed urbanization and effluent discharges from industries and households. Two years earlier, two similar events of fish die-offs were occurred in the Deogarh area of Odisha state, India on 18th June 2014. So, natural hazards, pollution and subsequent biochemical deficiencies including metabolic depression could be contributing factors too (Chainy et al., 2016; Paital, 2016b; Paital and Chainy, 2016; Paital et al., 2016b). 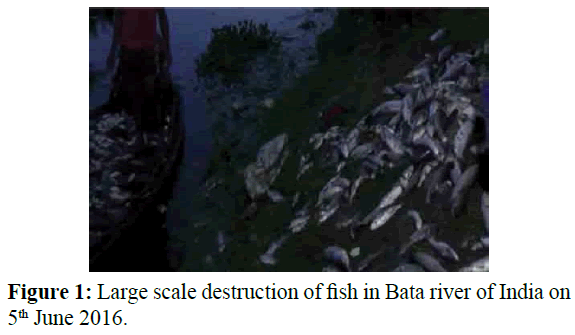 Figure 1: Large scale destruction of fish in Bata river of India on 5th June 2016. It is clear, from the above examples that mainly anthroposition, high speed urbanization and climatic factors such as El nino may be contributory factors for the consequences of such massive death of fishes (Espinosa, et al., 2014; Paital, 2016a, 2016b; Sciencemag. org, 2016). Therefore, strict regulations and follow up actions are highly wanting in countries such as India to protect the fisheries, the largest economically and ecologically contributory trophic level in global food chain. Planned bio-treatment of house hold wastes, strictly safe disposal of industrial effluents to be monitored by competent authorities and regular water quality monitoring, can be few of the major steps, that may result in preventing such future die-off episodes. Thanks to the Orissa TV.in, Prameya news for rendering their helps during covering the fields. Funding by UGC, New Delhi, India for providing Dr. D.S. Kothari Fellowship to BRP (No. F. 4-2/2006 (BSR)/13-853/2013 (BSR)) is acknowledged. Chainy, G.B.N., Paital, B., Dandpat, J. (2016) An Overview of Seasonal Changes in Oxidative Stress and Antioxidant Defence Parameters in some Invertebrate and Vertebrate Species. Scientifica. Article number 6126570, p:8. Epstein, P.R. (1999) Climate and health. Science 285, 347-348. Espinosa, F. (2014) Updated global distribution of the highly endangered marine limpet Patella ferruginea: an example of biodiversity loss in the Mediterranean. Oryx 48, 266-275. Leaf, A. (1989) Potential health effects of global climate and environmental changes. N. Engl. J. Med. 321, 1577-1583. Paital, B., Rivera-Ingraham J.A., Lignot, J.H. (2016a) Reasoning, perspectives and approaches for the disasteric increasing frequency of large scale die-off events in the Bay of Bengal.PLOS Currents Disasters. Paital, B. (2016a) RE: Full speed ahead to the City on the Hill. ScienceÃÂ 352, 1-2. Paital, B. (2016b) Role of cyclonic storm as natural disaster and other factors on vulture mortality in India. J. Geograph. Nat. Disast. 6, 165. Paital, B., Chainy, G.B.N. (2016) Redox metabolism in fishes under thermal stress warrants more attention. J. Fish. Sci.com. 10, 22-26. Paital, B., Panda, S.K., Hati, A.K., Mohanty, B., Mohapatra, M.K. et al. (2016b)ÃÂ Longevity of animals under reactive oxygen species stress and disease susceptibility due to global warming. World J. Biol. Chem.7, 110-127. Sciencemag.org. News at a glance Science 352, 1148-1150. 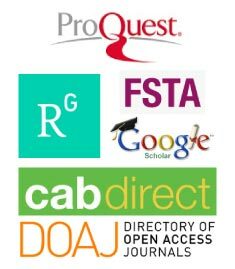 Sing, B., Crocker, R.J., EasunT,ÃÂ et al. (2016) Full speed ahead to the City on the Hill. Science 352, 886-889.